My newest model is done, but truly he’s not so new. 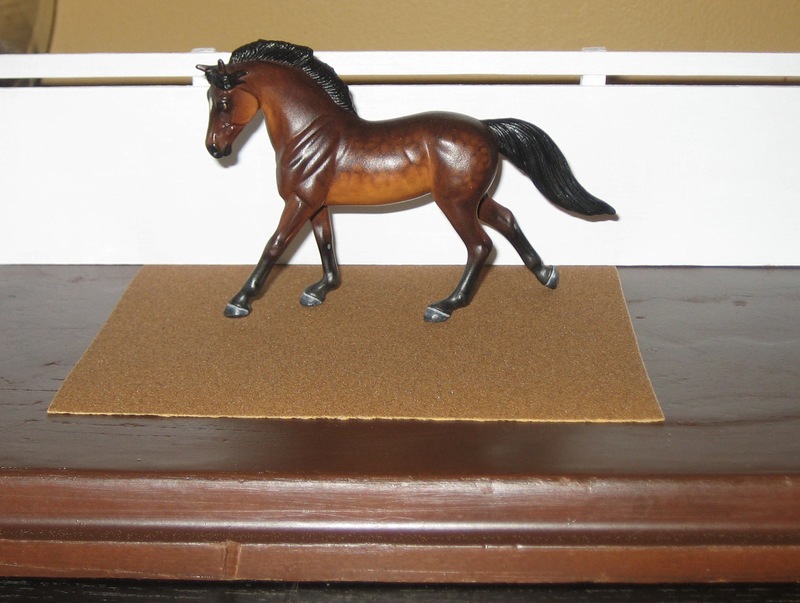 In fact, I started him five years ago when I first took a dremel to a Breyer Citation ornament. He languished in my work in progress zone for years, getting attention every once in a while. 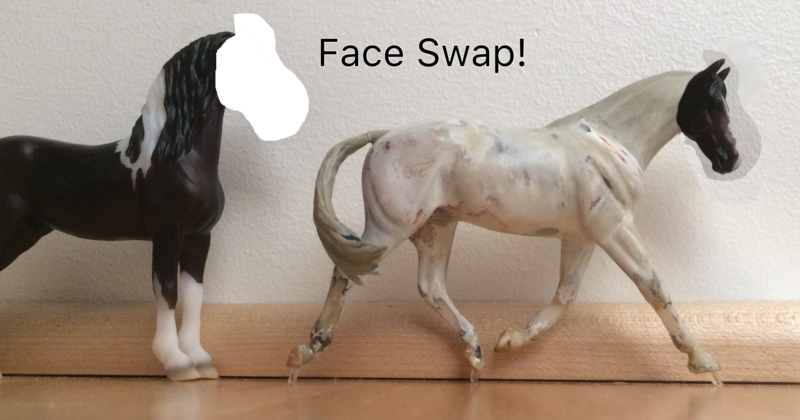 The poor thing even went through two or three head swaps as I tried to find one of the right size and worked on my head sculpting skills. I finally got truly motivated last winter when I decided this horse would be my BreyerWest performance horse. And several months later, he was finally done. I nearly defeated myself by deciding to paint him buckskin, a color I’ve never done in oils. And of course since he’s a large horse, he also needed a bunch of new tack. But I managed to get him and his gear done in time for BreyerWest, where he was the Overall Performance Champion. I am finally happy with how Fancy (as I called him while in progress) turned out, especially his floating trot. His head is from the Breyer stablemate Django mold, which turned out to be just the right size- and has such sweet character. His neck, back, mane, tail, ears and much of his legs is totally new sculpting. 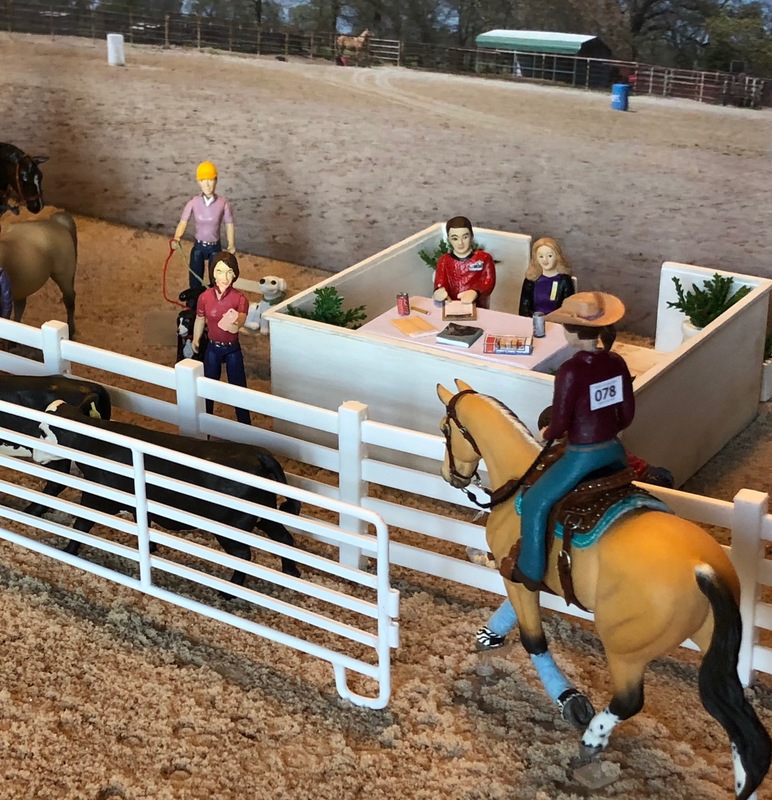 This month I’ve entered Pieces of Flair in the Breyerfest Best Customs Contest, in the Performance Excellence division. 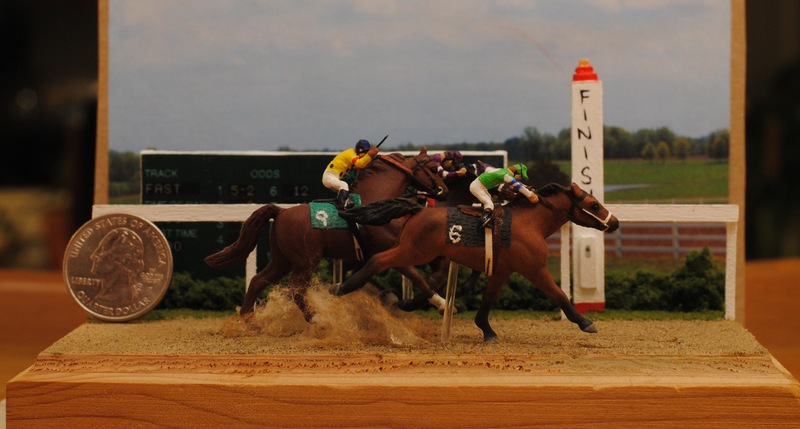 His entry is an expanded version of his winning stock work entry from BreyerWest. He’s shown doing a really neat event called Rodear, which is a newly-developed version of a cattle dog trial. The goal is to have the cows go into the chute and over the bridge. Fancy and his rider herd the cows while their cattle dog (left) blocks the other end of the chute. The scene from above, showing all the fun background elements. 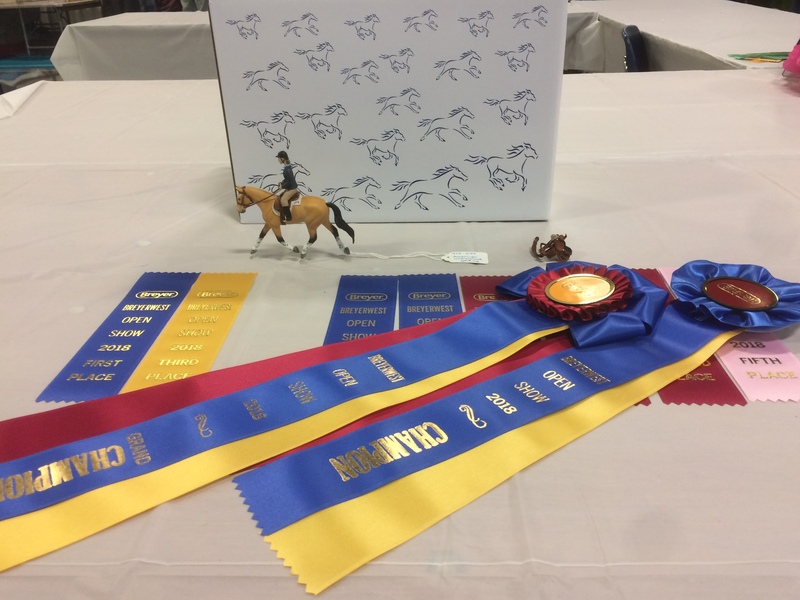 If I’m lucky, I’ll be selected as one of the finalists and get to bring Fancy and his gear to Kentucky with me for exhibition at Breyerfest! As of last night, the arena base is finished! I’m moderately pleased with it. I think it would look better if the dirt covered the whole base (which wasn’t possible due to fence measurement requirements) and if I’d found a way to keep the cool little hoofprints I made in the dirt (alas, they were destroyed by the fixative). But for anyone who would like to use nice, free dirt in a diorama, here’s what I did. First, I marked off the area I wanted with blue tape. 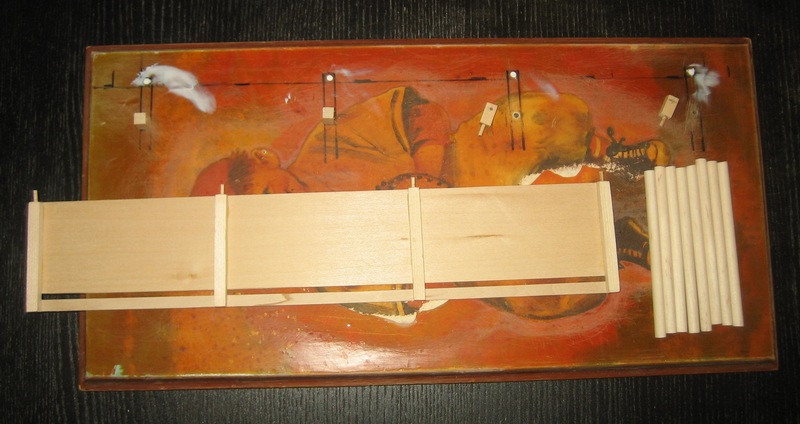 If you’re doing the whole top of a base, you would only need to tape off the sides. I put toothpicks in the fence post holes to make sure no glue or dirt would clog them. 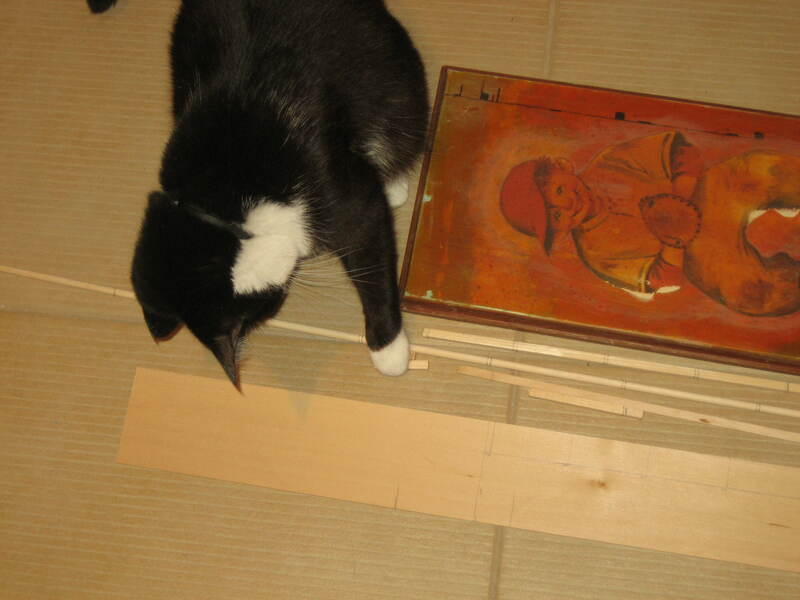 Then I slathered the area in modge podge, making sure to cover the whole surface thoroughly. 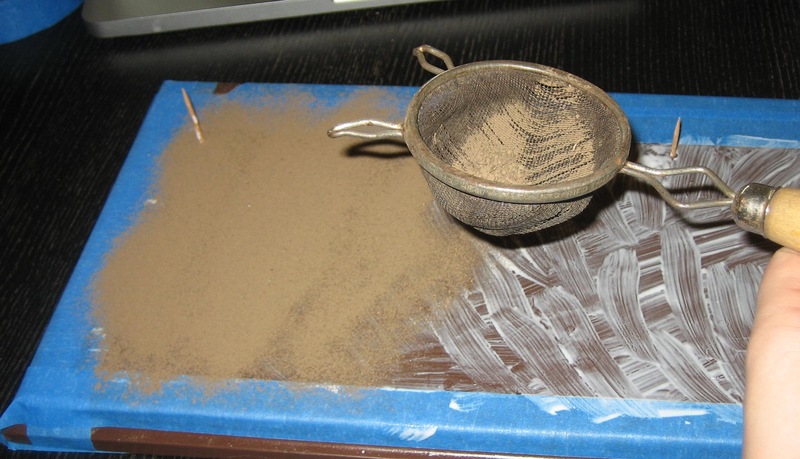 Using a sifter, I gently shook fine dirt onto the modge podge base. 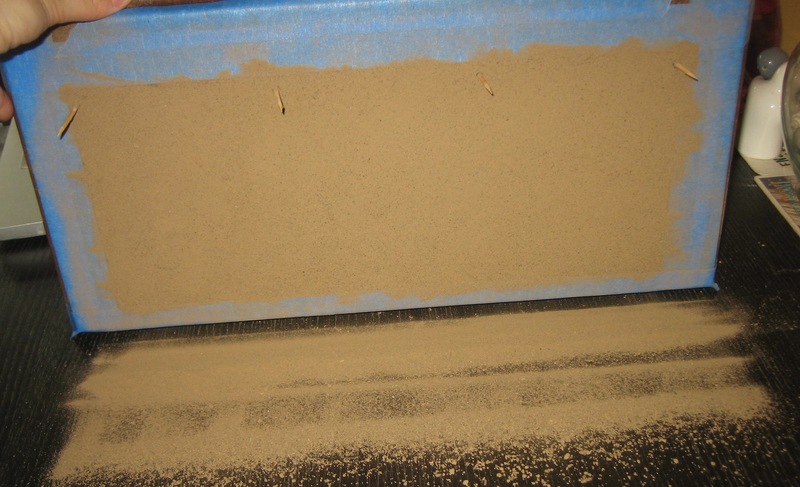 The dirt should be thoroughly sifted before this step so you don’t end up with big clods which are out of scale. 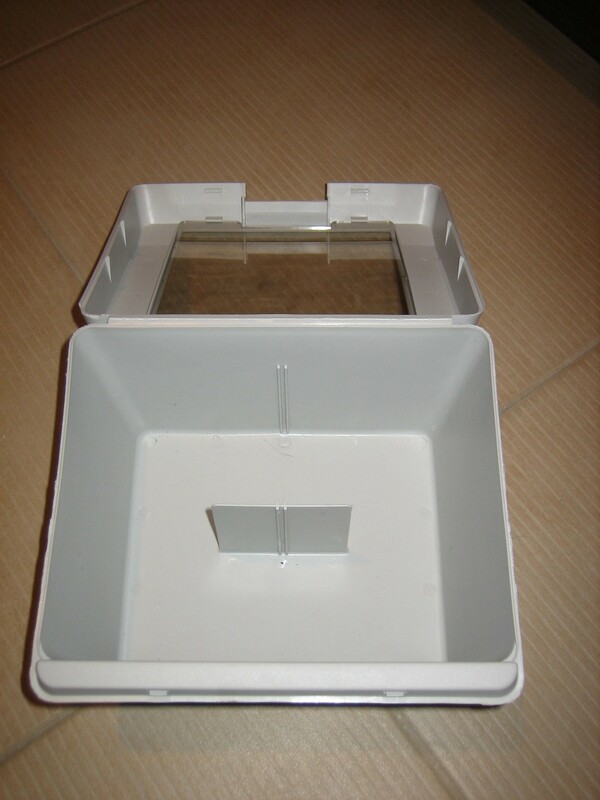 Cover the base in a thick layer of dirt to make sure you haven’t missed anywhere. Dump off the excess dirt. I would probably be better to do this outside than on the dining room table like I did. The last step is to fixative the dirt in place. Leave the blue tape on for this step to avoid fixing dirt or dust in the wrong place and to keep the rest of the diorama uniform. For fixative, you’ll want something stronger than the stuff you use on horses. In this case, being gentle will get you nowhere because the dirt won’t stick. I use hairspray- the cheapest, nastiest stuff I can get. It smells awesome but it sure does the job. Use several coats. 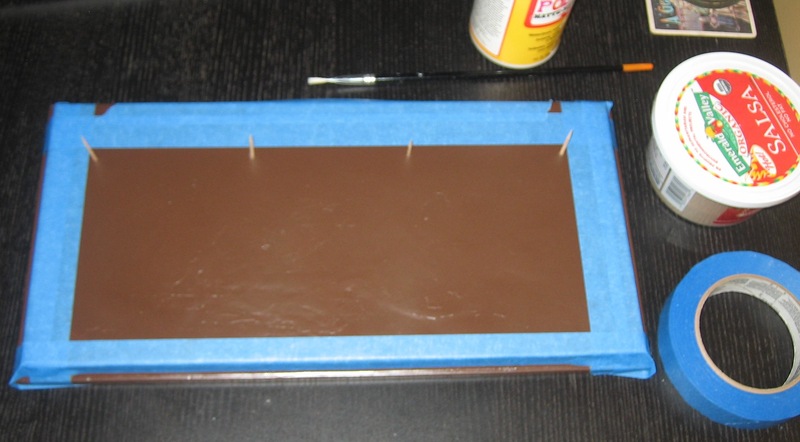 I finished my base with a coat of Matte fixative over the top to reduce any glossiness from the hair spray. 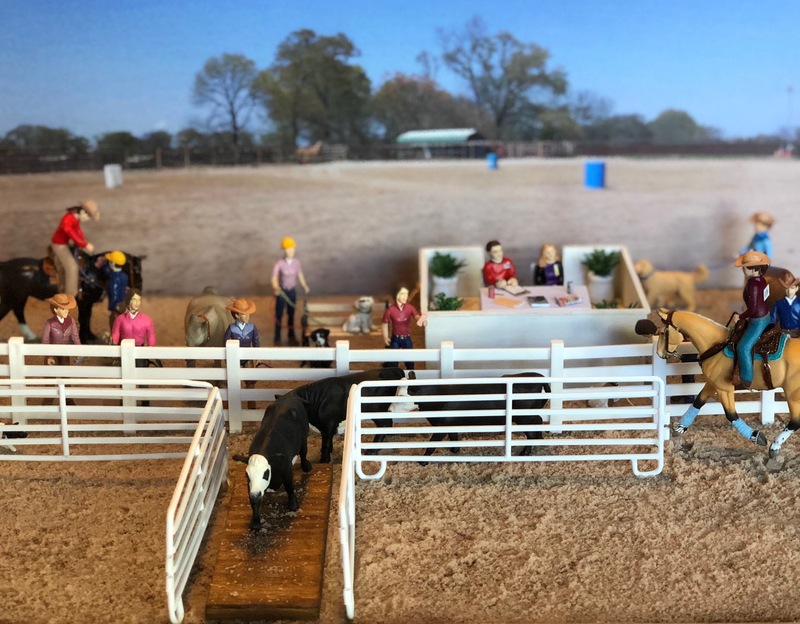 Here is the finished base with the arena fence (above) and the dressage fence (below). Sorry for the bad late-night photos- but you get the idea. 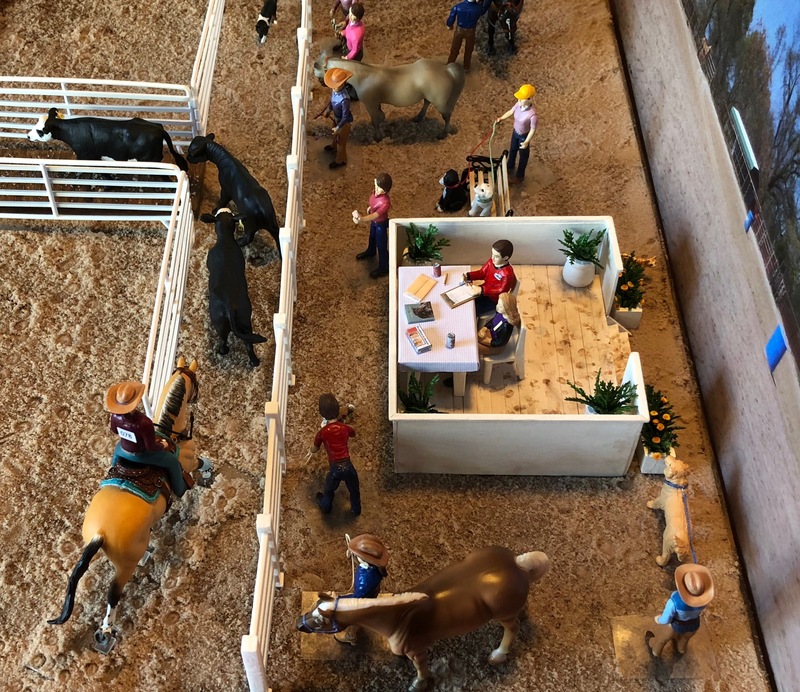 Thank you to Caryn Peck of Mountain Home Models for the interchangeable fence concept. I couldn’t resist adding my dressage letter and flower pots. 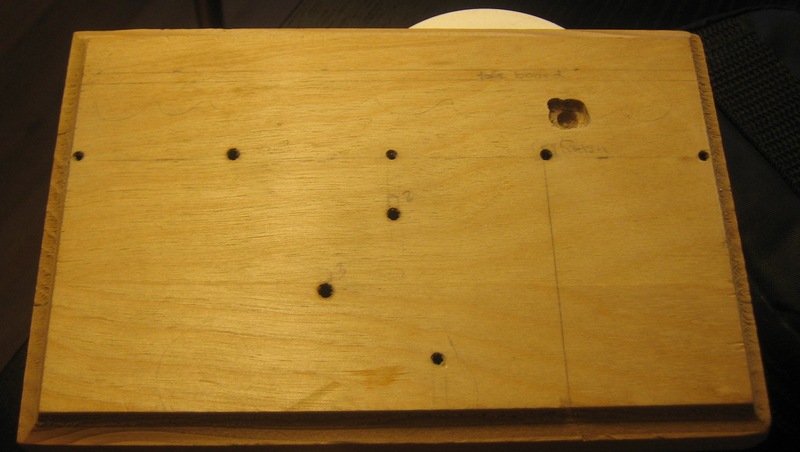 It’s pretty simple- the rectangles are just 1/4″ square dowels cut to size with a hole drilled in them and a toothpick in the bottom for a peg. The chain is white 2mm oval cable chain from Amazon. 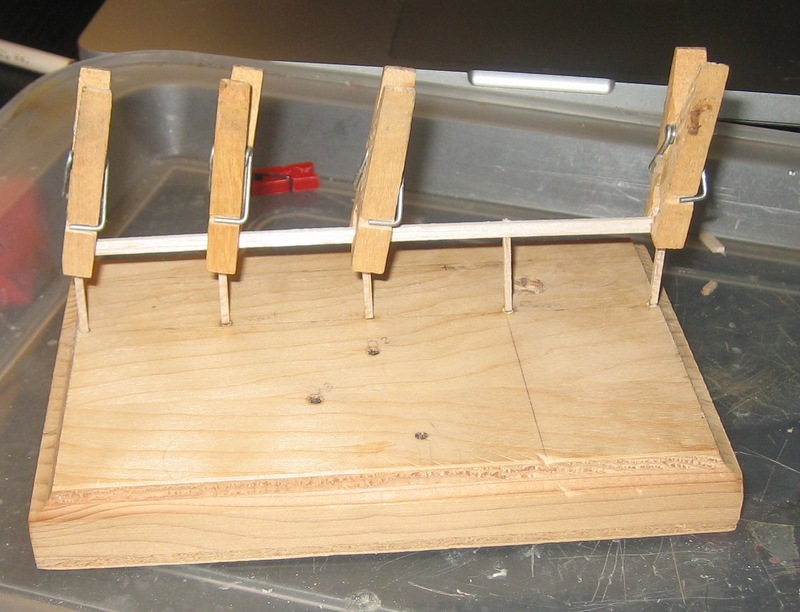 The chain is glued into the two end fence posts and just slides through the middle two. It sure is nice to have that crossed off my list. In fact, my to do list for the show is getting delightfully short. I have a halter to make (that’s this weekend) and some odds and ends, but nothing else major until packing day. Hurrah! I am getting very sick of being sick- it’s been nearly a week now. I’m feeling a lot better overall, but it’s difficult to sleep because of my very sore throat and I am constantly coughing and letting out terrifying explosive sneezes. Blarg! The sandpaper is there because I wanted to see how it would look with some arena footing. I have decided, once it’s all painted, to add a fixed layer of dirt. And that is why this lovely Easter Sunday morning found me outside, digging in a cemetery. (There’s a wonderful old pioneer cemetery behind my apartment, and that’s where I found the nice dry dirt). The dressage fence is done and I’m very pleased with it. And the two fences are nicely and easily interchangeable, which is great. 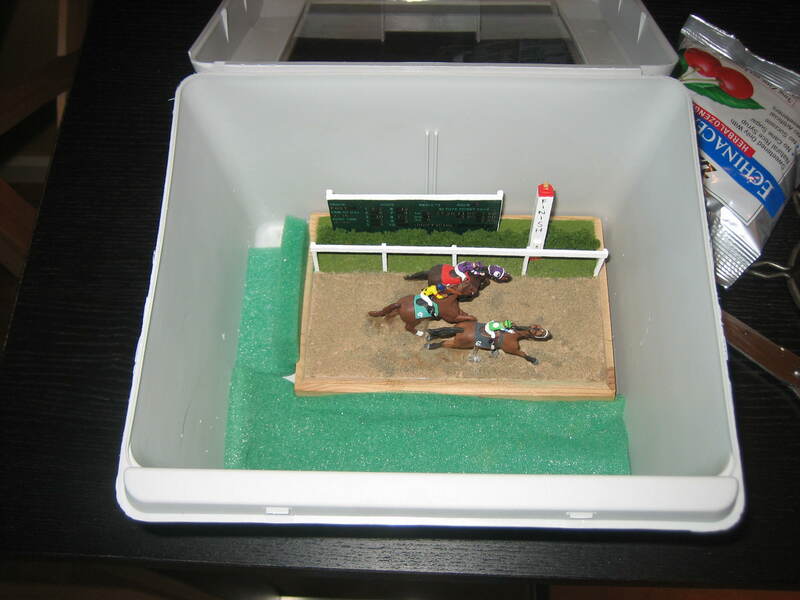 My other success today was making the perfect carrying case for my racehorse diorama, which I’m bringing to the show. I went to Goodwill and found an almost perfect container. Happily, a little quality time with my dremel got rid of that annoying protuberance and some foam provided just the right amount of cushioning. Rumble Strip and friends will travel in style and comfort, with no risk of smooshing. …And went from there. First there was a lot of measuring and cutting. Then there was some sanding. And sanding, and sanding, and sanding. And glueing. When I stopped late this afternoon, I had an arena panel fence, eight white poles, the start of a dressage fence (the little pieces on the left), and two partially painted cones. I also have a nasty blood blister, because I am careless and clutzy and apparently you can’t cut a nail with a pair of old pliers. But I am not unfamiliar with bleeding for the sake of crafts. Whenever I’m crafting or baking, I pretty much assume that I will sustain some bodily harm. But it’s always worth it, and I have a good stash of band-aids at hand. I won’t have any time for hobby stuff this week, but I’ll be back at it next weekend and step one will be painting over that terrifying child. That’s right, Victoria has a miniatures museum. I spent a wonderful long time there and took a whole bunch of photographs in a futile effort to capture the awesomeness of it all. And I’ve uploaded the best ones for your perusal! If you ever have a chance to check out miniature world, I definitely recommend it. It’s $13 (Canadian) but in my opinion well worth it, as long as you really have the time and patience to take it all in. Because there is a lot to see. Thank you to Long Road Home for recommending that I add dust. I think it really completes the scene! Thanks to Robyn, for the original bodies. To my husband for the lovely pictures. And to the cast and crew of Stargate: SG-1, for providing me hours of entertainment while I fiddled with tiny race horses. 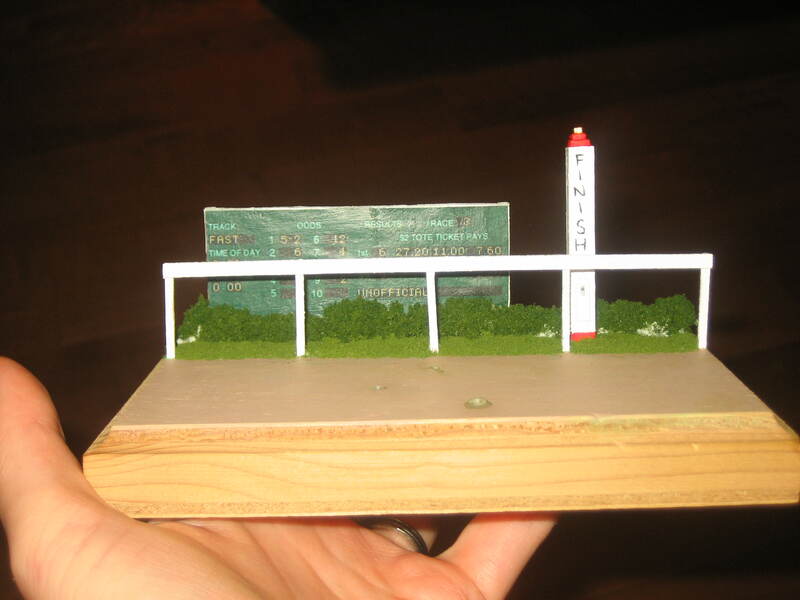 After countless (let’s not count…) hours of work, my little diorama is done. I’m immensely pleased with how it turned out, and love to look at it sitting on my shelf. It was an extremely satisfying project and let’s me fulfill my dream of owning a Thoroughbred race horse named Rumble Strip. 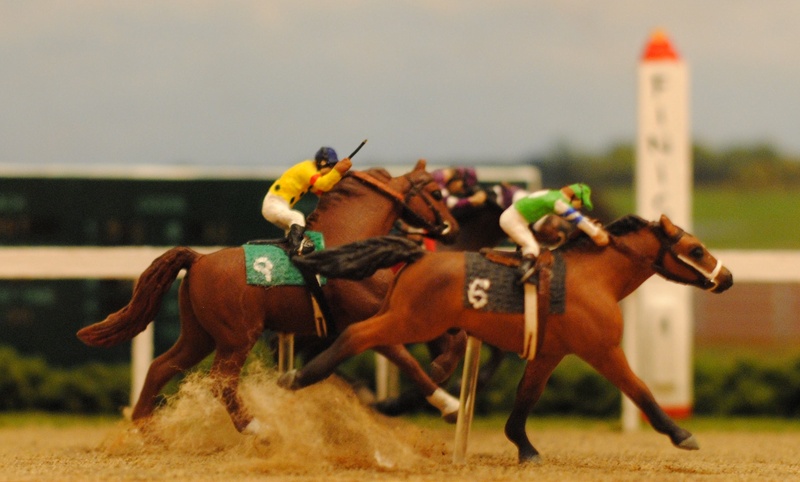 I am really excited to be getting so close to finished on my race horse diorama. I am also excited that I haven’t gotten too terribly distracted during the process (at least, not by other pony-projects). 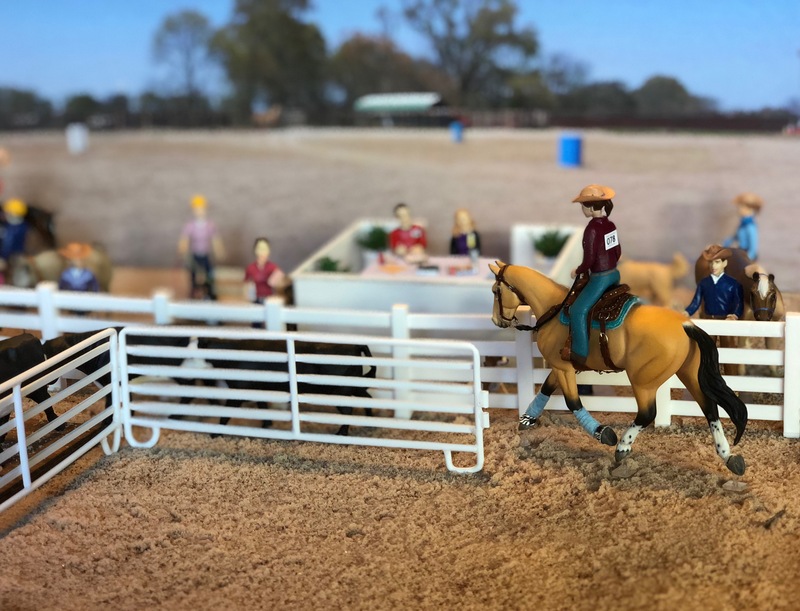 This post is a review of how I did the base, complete with tote board, finish line, rail fence, and footing. First step was to find a suitable base. I was lucky to have one handy in my box of supplies. 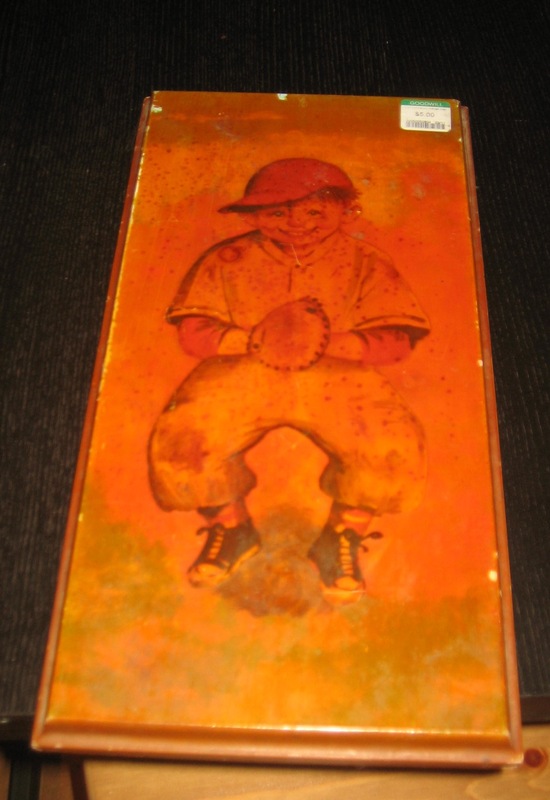 I got this secondhand, probably at a garage sale or thrift store. I always snag super-useful things like nice wood bases if I can find them on the cheap. These are often available in craft stores, but the cheap skate in me balks at paying $6-$10 for a piece of wood, however nicely shaped. I used a dremel to make these holes. I don’t have a drill, and a dremel makes a decent substitute for small scale projects. You can see I had to get a little creative for my finish line hole the correct size. I first planned the base out and drew guidelines with pencils. Planning the size of the rail fence and spacing between posts was crucial, since I needed to drill holes to “plant” the posts. Similarly, I measured out where I wanted each horse. 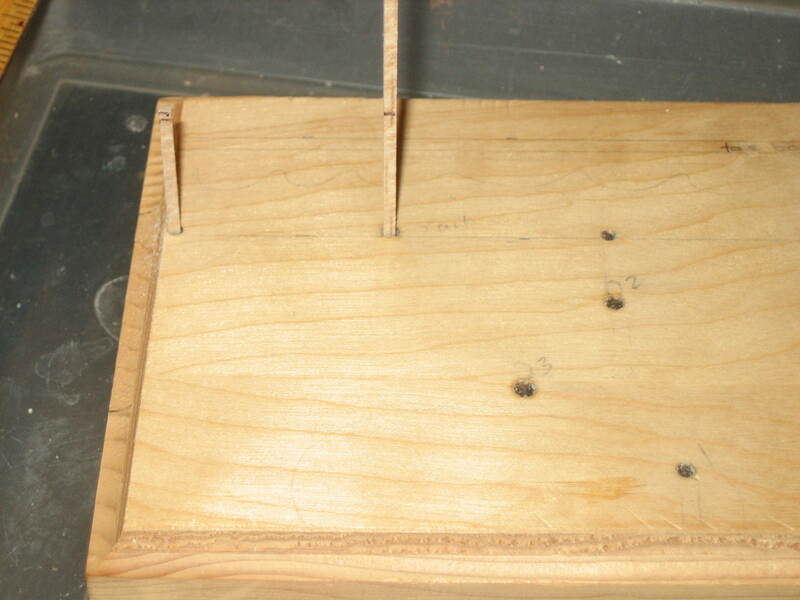 Their acrylic rod supports will be similarly planted. 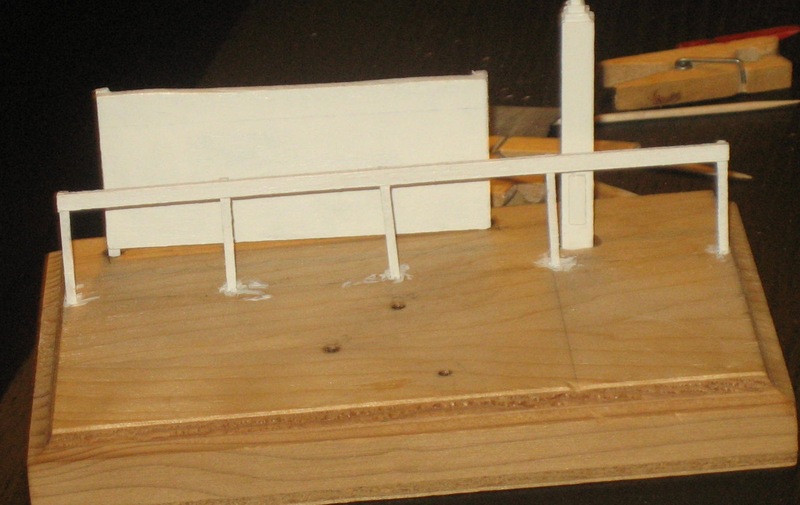 I decided to build the rail fence right onto the base instead of building it and then attaching it. I hope this will make it sturdier and my measurements will remain more accurate with less option for error. For each post I inserted my square wood dowel firmly into the hole and then measured to the correct height (see the pen mark). Then I pulled it out, cut it, and stuck it back in. Voila, posts! 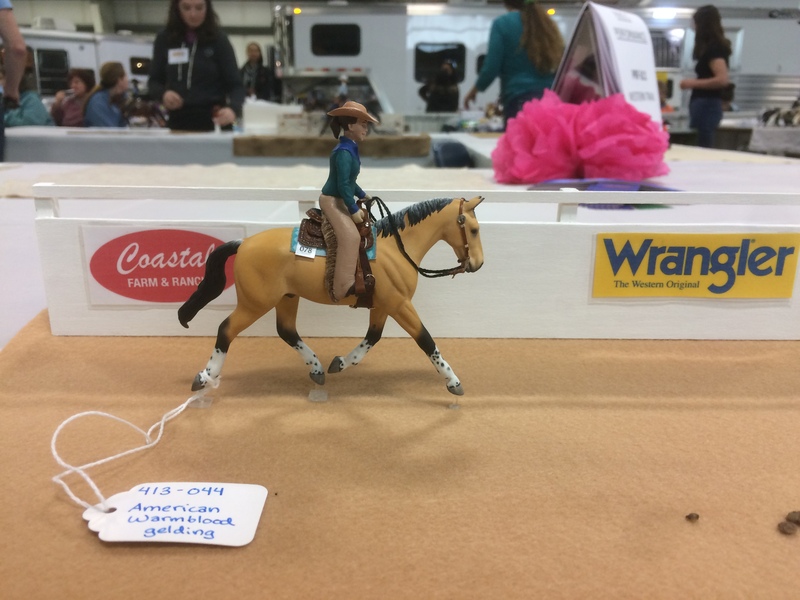 Mini safety pins are invaluable for model tack and props. I only wish I had more of them. To make the top of the rail fence I simply cut a piece of the correct length (and double checked the length). Then I carefully glued it to the posts, trying to keep them as straight as possible. Then I clipped them to keep them in position while the glue sets. 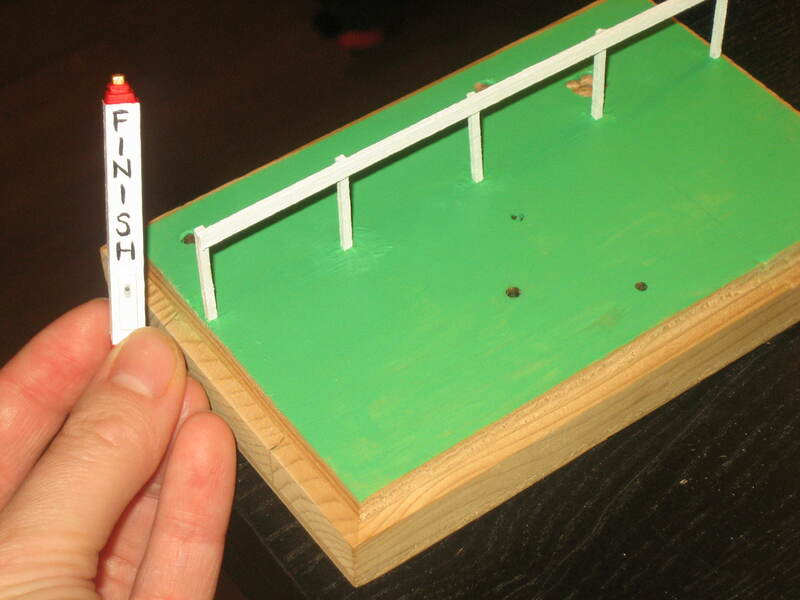 Making the finish line pole was a careful balance between creativity and realism. Most poles have some decoration on top, but some of the examples I found were too elaborate for the scale or simply unattractive or impractical. I looked a a bunch and then designed my own, while is simply a wooden pyramid that will be painted red and gold. 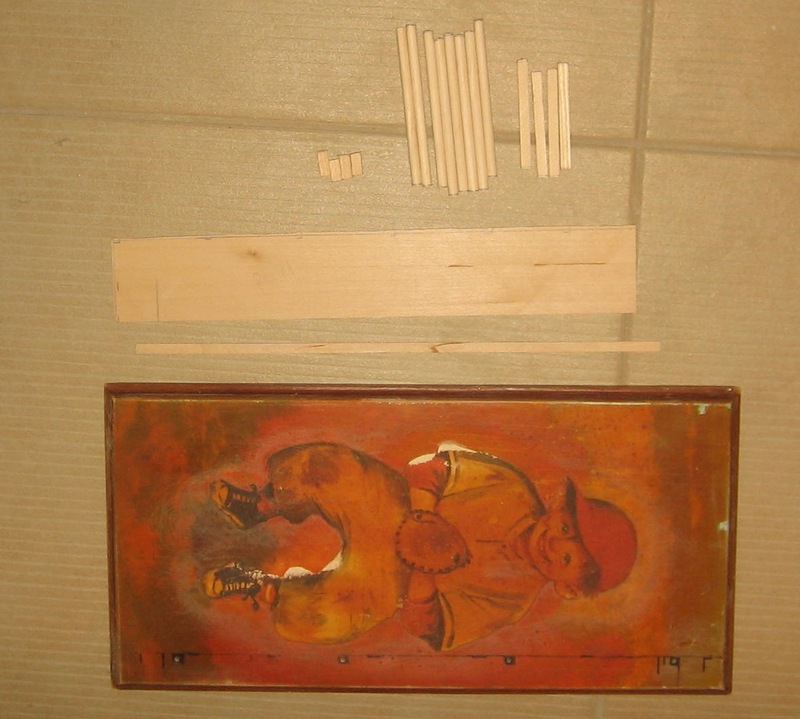 I made it by using ever-smaller pieces of balsa wood stacked and sanded. That top piece was very pesky- it’s about 3 mm long and easy to drop or loose. Or inhale. Along the bottom are marks to remind me how much of the pole will be buried in the base (bottom), and where the rail fence comes to. In between the two I mounted a flat piece of foot that mimics a finish line’s camera. 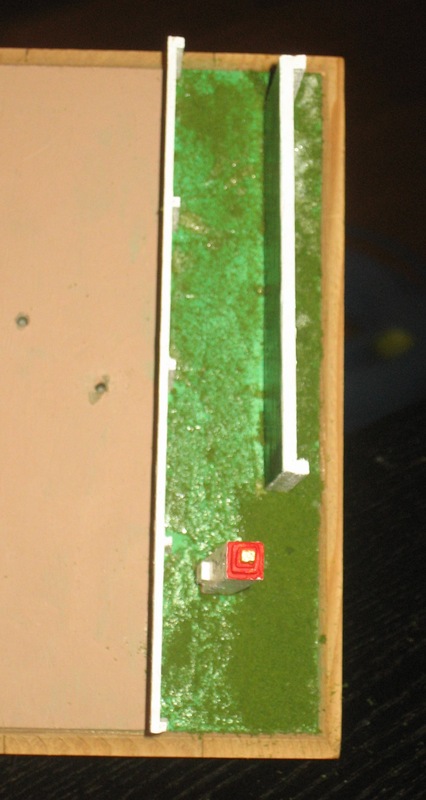 The rail fence has been glued into the base with wood glue. 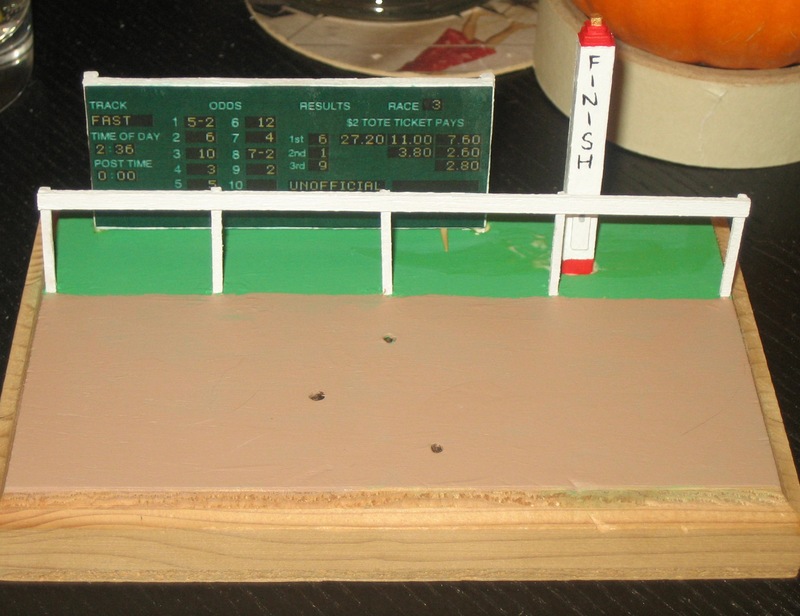 The tote board and finish line are propped there, and all three are painted white as a base. 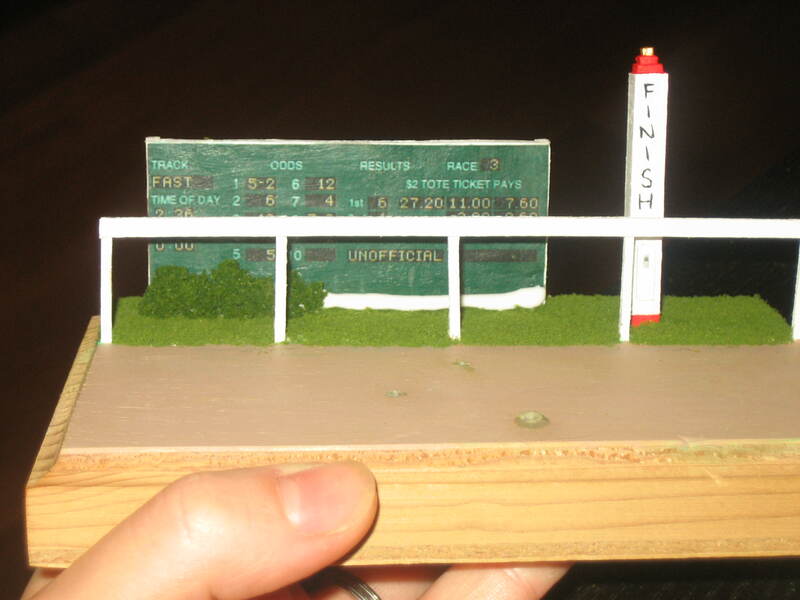 Before gluing the finish line in, I painted on the itty bitty details. Meanwhile, the fence and base get more paint. Tote board and finish line are attached, painting continues. It starting to look like a race track! As with the finish line, I didn’t want to have to do tricksy detail on the tote board while it was glued vertically into the base. Once I made sure everything was the right size, I used that every-useful modge podge to attach the printed tote board picture to the wooden base. Over the painted base I’m gluing footing. The “grass” I’m using is Woodland Scenics dark green turf (fine, not coarse). It’s messy and sort of annoying to work with, but has a lovely effect. I hadn’t used it since my last diorama and didn’t remember the technique. I tried laying down glue and then scattering the turf, which is pretty ineffectual. What worked for me was laying down more glue with more turf, and then pressing it down with my finger. It looked kind of bad at first, but remember that glue dries clear! In the picture at right, the bottom right corner is where I used my improved technique, and the other areas are where I tried to simply scatter the grass. For added detail (and because I have a TON of faux shrubbery) I planted bushes along the edge of the track. I simply lay down tacky glue and pressed my formed bushes down firmly on top. I need to wait a bit before I can put down the track footing, because I used apoxie to fit each horse’s acrylic rod to the dremeled hole and it needs to dry. The track will be done in much the same manner as the grass, only I’ll use sand or another “dirt” base. I still need to decide if I’ll be permanently attaching the horses to the base or not. 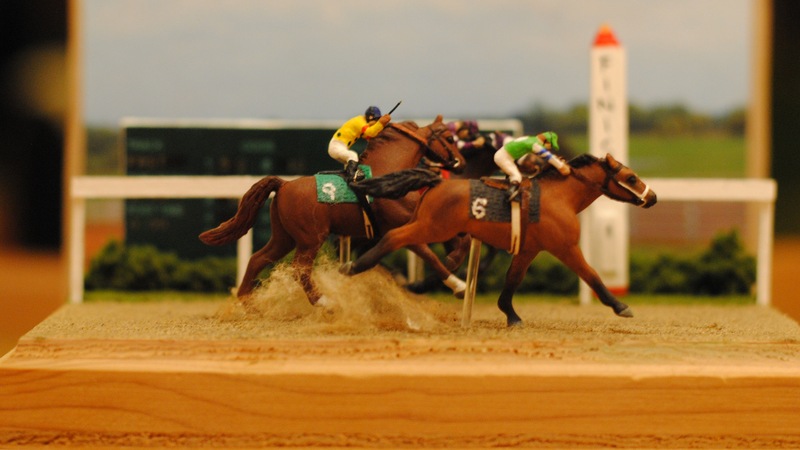 That would mean finishing up jockeys and bridles. Coming right up!